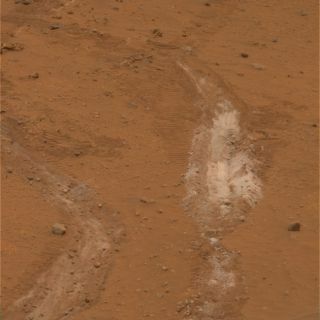 The strongest evidence yet that ancient Mars was much wetterthan it is now has been unearthed by NASA?s Spirit rover. A patch of Martian soilkicked up and analyzed by Spirit appears to be rich in silica, which suggestsit would have requiredwater to produce. Chemical analysis performed by the rover?s roboticarm-mounted science instruments measured a composition of about 90 percent puresilica -- a material commonly found in quartz on Earth -- for the bit ofMartian dirt, said mission scientists, who first heard of the find during ateleconference. "You could hear people gasp in astonishment," saidSteve Squyres, principal investigator for NASA?s twin Spirit and Opportunityrovers at Cornell University in Ithaca, New York. "This is a remarkablediscovery." This discovery came about unexpectedly as the result of amechanical failure. Both Spirit and its twin rover Opportunity completed their originalthree-month missions in April 2004, and are aging. One of Spirit's sixwheels no longer rotates, gouging a deep impression as it drags through soil.That scraping has exposed several patches of bright soil, leading to some ofSpirit's biggest discoveries in its GusevCrater exploration site, including the most recent find. Spirit had previously found other indicators of long-agowater at the site, such as patches of water-bearing, sulfur-rich soil,alteration of minerals, and evidence of explosive volcanism. One possible origin for the silica may have been interactionof soil with acid vapors produced by volcanic activity in the presence of water,though the material could also have formed in water in a hot spring environment,NASA said in a statement. The latest discovery adds compelling new evidence forancient conditions that might have been favorable for life, the space agencyadded. Researchers informally dubbed the newly exposed patch ofsoil "Gertrude Weise," after a player in the All-American GirlsProfessional Baseball League. "We've looked at dozens of disturbed soil targets inthe rover tracks, and this is the first one that shows a high silicasignature," said Steve Ruff, of Arizona State University in Tempe, who firstproposed using Spirit?s thermal emission spectrometer to study the overturnedsoil?s mineral composition last month. The silica readings in the overturned soil prompted missionmanagers to drive Spirit close enough to touch the soil with the rover?s alphaparticle X-ray spectrometer. Silica commonly occurs on Earth as the mineralquartz, and is the main component of window glass, NASA said. The Martiansilica at the Gertrude Weise patch is non-crystalline, with no detectablequartz, the agency added. Spiritworked within about 50 yards of the Gertrude Weise area for more than 18 monthsbefore the discovery was made. "Thisis a target-rich environment, and it is a good thing we didn't go hurryingthrough it," said Squyres.